The Russian Blue cat is a mysterious cat, friendly and very balanced. Her ideal companion is someone has quiet character, who can give her an intense affection and not leading a life too overloaded and stressful. It could be adapted and live peacefully in a quiet family and without restless or noisy children, which would prevent her from lounging quietly. The origins of Russian Blue cats are surrounded by a halo of mystery. Some believe that its origin is Russian because there are still a few copies that resemble it in this country. Others, against, reject the hypothesis of Soviet origin and say that he was raised in England and it appeared in 1900 in America. The Russian Blue has been described for the first time by Frances Simpson in a publication from 1903. The author relates that one of these cats arrived in England in 1860 aboard a British merchant ship; some marine during the stopover in Russian port of Arkhangelsk (the White Sea), would have brought a few copies and reportedly sold at a good price to the English, thus promoting dissemination throughout Britain. The name of the breed, as its origins, is a complicated history: in the past, it was called Spanish, Maltese cat and Russian Blue. The current name, Russian Blue, is recent; Indeed, he was awarded during this century. 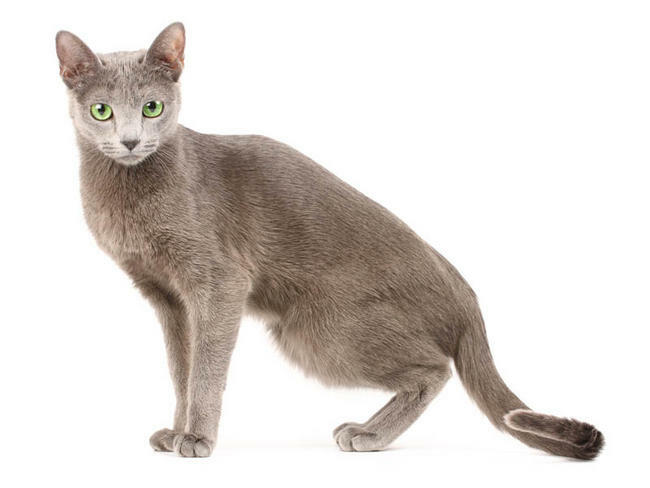 This cat is prized for the texture and the color of his fur, but the official recognition of the breed has not always been simple because, in exhibitions, it was considered at the same time with the British blue color, which, by his build more robust, the Russian Blue was preferred to the more slender silhouette. The Russian Blue cat is like the Carthusians, but its structure is lighter, flexible and slender. It has an elongated and solid body, which makes it both its charge line by its movement. The musculature is thin and elastic and the framework is tricky (it may seem robust because of dense hair). The head is short and triangular, with a long, flat skull. The muzzle is medium length, the forehead is high and flat, straight nose, the chin is strong and aligned with the tip of the nose and the corners of the mouth back (it seems that the cat smiles). Lips and nose are dark gray, the pads can be gray or pink. The neck is long and graceful, but it may appear short because of thick hair. Russian Blue cat has a coat color of a particular and original key. The base of the hair color is an intense blue, which should be uniform and if possible in a clear tone. The characteristic that distinguishes this color from the Chartreux, the silver sheen of the tip of each hair, which gives the dress a bright and sparkling look. Russian Blue cat has a quiet and gentle temperament that allows him to easily adapt to domestic life. Even males, in fact, unlike other breeds cats, rarely abandon their homes, and also during the mating season. Russian Blue cat does not demand special care. You just remember that kittens will live without any problems by changing their environment and master after the age of seventy days: indeed, they should be weaned by their mother and face their first vaccinations with her .you can also keep multiple copies without problems, because they are very affectionate cats and tolerant, accommodating itself well between them, which makes them excellent parents.